Summer is here in Memphis and it is arriving quickly for the rest of you, even if it doesn’t feel that it is. So this is the time of the year that we work long hours grading final exams and doing more math than many of us care to do normally in order to get grades submitted on time. So my question to you is this, what do your grades communicate? Do your grades paint a picture of the language your students have developed this year? Do they communicate how well they followed directions? Perhaps this is something that you haven’t thought about. As an administrator and working with many principals I can tell you it is an important distinction. Now or as school closes is the time to reflect over the year and the messages we send on the permanent records of our students to advocate for or against language learning. I say it like a broken record, every day in our classrooms we send messages to kids about who they are as language learners. Grades, send the biggest, loudest message. So what do they say? Let me share two interesting situations I experienced this school year to get you thinking. We offer level one high school courses in eighth grade students at middle schools that matriculate to high schools with AP programs. In order to earn the credit you must maintain a 76 in the course all year, pass a curricular end of course exam, AND meet or exceed the benchmarks on an external proficiency assessment such as STAMP and AAPPL. Before you are admitted to the course the student and parent must both sign an agreement that outlines the above. Just to ensure your expectation as are clear and upfront. The End of Course (EOC) Exam was created by the teachers of the course and the format has not really changed over the years. Every district provided assessment is geared to prepare students for the EOC. So imagine my surprise this year when a principal called me into his office to explain that six students had not passed the EOC in one of these courses. I was stunned because this had never happened. One or maybe two students not being successful are not uncommon but six? To further the issue, he had researched their grades all year. Every one of them had an A for the year… all year. The principal’s question to me was how can they have an A in the course and not be able to pass the EOC? Great question principal! On the other side of town, in another middle school program, a teacher comes to me with her AAPPL scores. She is perplexed on what to do with a student, let’s call him Terrence. She goes on to explain that Terrence has really not done his best all year. He was forced to take the class by his mom, and really wanted to be in another class. The teacher explains all the ways she tried to reach him and make the content pertinent all year. He has barely maintain the required 76 and scored a 76 on the EOC. The kicker was his AAPPL scores. On reading he scored NH. OK no big deal, not bad but not great. But get this, on speaking he scored I2 and on writing I4. WHAT????!!!??? What was he doing all year? The teacher was floored. Her immediate question was shouldn’t he get an A because he obviously mastered the content according to the AAPPL scores. However he never did homework and rarely exerted any real effort in class. Great question teacher! My question to both was “What do the grades represent?”. Now I pose the question to you. What do grades represent? What should they represent? Are grades control mechanisms designed to monitor how well students jump through hoops and follow directions? Or are grades representations of students’ academic growth and supported by evidence of their performances? Please do not misunderstand me. Following directions is an important life skill, I am not knocking it in any way. I hope however to challenge you to consider what earns points in your room because that it was matters. What is measured is what matters. What earns points is what matters. SO how do students earn points in your room? Let’s look at grades from a couple of perspectives. Whether you use total points or weighted grade formulas how do you account for performance assessments? Below you can see two different grading scales for weighted grades. What message do both send? 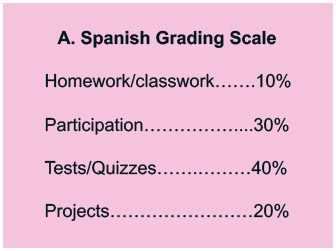 Grading Scale example B puts the expectation that students will need to use what they learn front and center. There is no question at this point of the expectation for application of learning. It is a small tweak, and does not change the math or the scale that was originally example A. It merely shifts the focus to Performance Assessments in example b. How could you make your expectations for application of learning explicit in your grading scale? Remember the student that had mediocre grades but did surprisingly well on the AAPPL assessment? If the teacher had a grading scale like scale B would he have performed differently throughout the term? How do students earn points: for completion? for perfection? for growth? If our grades throughout the term are not aligned to the end expectation then it is counterproductive. If our goal is performance in nature such as at the end of the level one our program wants to produce Intermediate Low speakers and writers of our language, then everything we do should be geared to that goal. This means we have to offer opportunities for students to grow. A target: A target creates clear expectations upon which you can build an understanding of what those expectations look like in an age appropriate way. Aligned instruction: We must teach to the target. Kids have lots on their minds throughout the day so it is critical that we align our instruction to keep them moving toward or beyond the target. We need to align our learning targets to the performance targets. We must focus students on the target daily. It’s as simple as after sharing the learning target asking students what is our target? What does an intermediate low (for example) do? Then launch into the work. Opportunities to perform: Performances lead to proficiency. Therefore performance assessments enable number 4 to happen, Feedback. If we hope for students to build communicative skills they need to practice them in realistic scenarios. Ultimately our goal is to prepares students for whatever opportunity may present itself. Being able to communicate in another language domestically or internationally does not change the need for comprehensibility in that language. Feedback: Our students need meaningful feedback that they can use to feed forward to future practice. If we provide feedback on the structure of their communication then our students can continue to grow across curricular units with new content. By structure I mean are students using sentences? Are they connecting simple sentences? Are they using transition words and details to build complex and interesting sentences that are still comprehensible. We must shift our focus from the new vocabulary to how it is used; within what structure. As you grade student work, does it account for growth? Do the grades align with the district or program targets? Is what are your grading for align to your target? 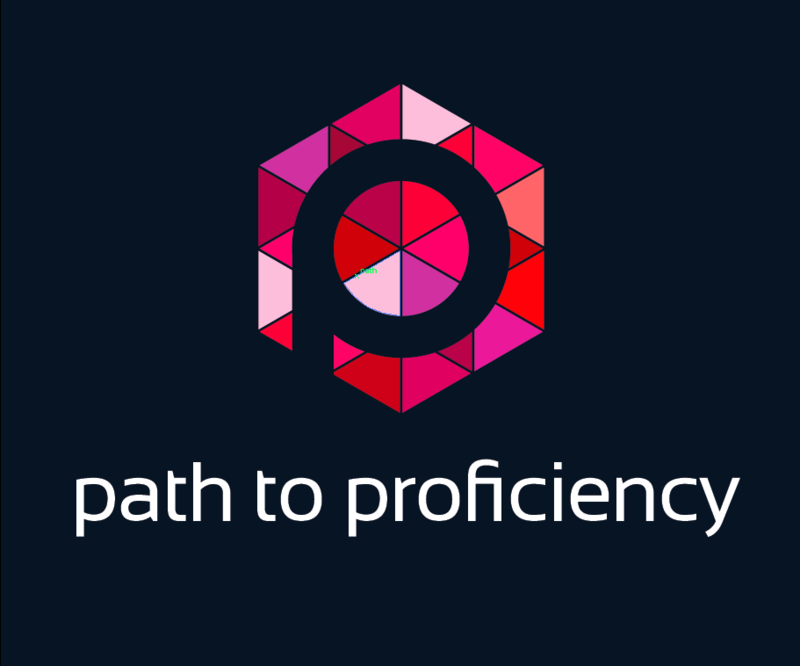 It’s important to become a practitioner of the proficiency guidelines. The guidelines really outline language development for us. You don’t need to be an expert in second language acquisition to do this. The Guidelines outline for all language teachers how second language develops. It provides us realistic expectations for the development across a course trajectory. For example the proficiency guidelines refer to comprehensibility at the lower proficiency levels and as they scaffold toward advance you will see a subtle shift to the increasing importance in accuracy. So why spend hours taking points for accent marks for example? Have the students identify the errors as a way to use feedback but spend your time focusing on the comprehensibility of the performance. It is easy to find all of the errors in novice language practitioners, bit how does that inspire them to improve? If we score based on accuracy when the goal is comprehensibility then we have mixed messages. What gets scored however will take precedence over our goals. In the shift to a performance focused classroom grades are often the missing link. We have to send a unified message about what is valued and important in our classrooms. Hopefully that is real world communicative skills. While there are times I wish I could see the future the truth is we can’t. Therefore we must prepare kids for whatever their future holds for them anything less is unacceptable. Real world communication is what counts. It is our charge, to develop students that can communicate in culturally appropriate ways in the target language. To those ends we must assign grades in a way that further develops students language skills toward or beyond our targets. I encourage you to reflect over what gets scored in your room currently. What message are you sending and does that message move students closer to the target? If not, how can you make the shift?